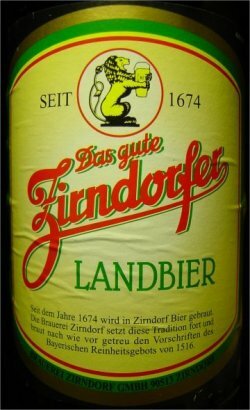 UPDATED: FEB 24, 2019 Ein eher durchschnittlich Landbier aus Bayern. Serviert in einer 0,5 er Flasche schmeckt das Bier vollmundig. UPDATED: OCT 24, 2018 0,5l bottle from netto Nürnberg- copper clear as someone else noted - malts fruits aroma and taste with a bitterness on the end - descent Landbier to drink ! 2 August 2018. At Salino, Bamberg. Cheers to Anke! Pours clear copper with a lasting, small, foamy, off-white head; lots of lacing. Aroma of grain, red apple, apricot, faint banana, caramel & bread. It tastes medium bready sweet, hints of apple & caramel, and light grainy bitter, a bit grassy & yeasty. Dyish, grainy finish, yeasty, faint grassy hops, slightly metallic. Light to medium body, creamy texture, lively carbonation. All very subtle, just okay. UPDATED: AUG 16, 2018 Bottle. Clear dark gold/amber with a huge white head. Aroma of grains, malts and floral and slightly spicy hops. Taste is grains, malts, old noble hops and tangy apples. Almost sweetish without any bitterness. Low carbonation. Very easy drinking. It's alright but I'd probably appreciate it more if I had more than a couple of this - as this beer was clearly made to be consumed in large amounts while listening to old Speed Metal records and smoking way too many cigarettes. Bottle. Pours clear deep golden with a white head. Aroma of butterscotch - borderline diacetyl, hay and grains, rather fruity nose, toasted malts. Taste is rather sweet, loads of butterscotch, slight nutty - leaves, loads of slight toasted malts, slight yeast. 17/6/2018. Bottle from Evin, Helle. Pours dark gold with a foamy just off-white head. Aroma of caramel, fruit, vegetable, light butter, hops and malt. Medium sweetness, light bitterness. Light body, slight oily and watery texture, soft carbonation. Bottle. Clear amber-copper color with creamy white head. Aroma is nutty, caramel, grainy. Taste is nutty, popcorn, grainy, quaffable. Fatty oily mouthfeel, almost flat. Tasty!